Point2 Homes gives you far more than a simple list of houses for sale. Get instant access to a lot of relevant information about Fort York, Toronto, ON real estate, including property descriptions, virtual tours, maps and photos. The search results pages also have a wealth of information on Fort York, Toronto, ON, if you scroll all the way down. There are 83 houses for sale in Fort York, Toronto, ON. 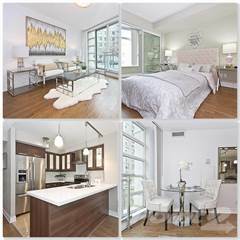 Searching homes for sale in Fort York, Toronto, ON has never been more convenient. With Point2 Homes, you can easily browse through Fort York, Toronto, ON single family homes for sale, townhomes, condos and commercial properties, and quickly get a general perspective of the real estate prices. Also, you’ll never miss a bargain if you filter listings based on house price drops in the past six months. Use the map view to find Fort York, Toronto, ON homes and apartments for sale, based on amenities or city features that you may want close by. You can close in on a specific neighbourhood or area by simply drawing around them with the polygon or radius tools. Stay informed about the latest entries on the real estate market by saving your searches. This way, you get new listings in your inbox, daily or every week, based on your preferences. If you’d like to get in touch with a professional, agents are displayed next to their listings, and they’re easy to contact through the online forms. If you want more options, you can click the Tools tab and Find an Agent, and you’ll get a list of helpful and knowledgeable real estate agents in Fort York, Toronto, ON. Visit the Point2 Homes blog and you can find up to date expert advice on many markets throughout Canada, regular market reports, neighbourhood scoops in cities throughout the provinces, real estate deals and useful recommendations. Fort York is a neighbourhood in the southern end of Toronto, Ontario, located very close to the downtown core. Located to the west of the city centre, the neighbourhood is primarily residential. Built around some of the most historic sites in Canada, Fort York is an interesting mixture of Canadian history and modern Toronto condo dwelling. Fort York is located to the West of Cityplace. Bathurst Street marks the western edge of Fort York. Strachan Avenue runs along the eastern boundary. Lake Shore Boulevard separates Fort York from the southern edge of the city. The northern boundary includes the entirety of the park that contains the Fort York Historic National Site. The Fort York historic site is the primary feature of the neighbourhood. What is left of Fort York has been there for more than 200 years, and was one of the most critical sites during the war of 1812. Within the park that contains the site, there are many buildings original to the era that have been preserved and maintained as a monument to one of the most pivotal events in Canada’s history. Fort York is very much a residential neighbourhood. This is not the type of neighbourhood where people come to work, or one with any appreciable amount of industry. Instead, it is a giant enclave of condo towers that provides housing for thousands of people who work in the business districts downtown. In fact, there is so little industry in the neighbourhood that it is one of the quietest central Toronto neighbourhoods during business hours. The constant hustle and bustle that fills commercial districts is totally absent, as the vast majority of the people who live in the area work elsewhere. The only real commercial presence in Fort York takes the form of the small shops and offices that line the ground floors of the condo buildings. These are mostly comprised of things like coffee shops, health services, and other businesses that cater to those that live in the buildings above their places of business. This neighbourhood is in many ways a young professional’s dream. The buildings are all new, which avoids the difficulties and problems found in older residences. 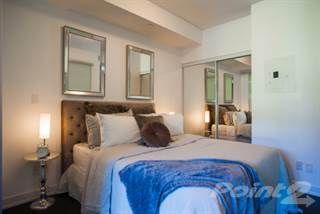 They are also more affordable, due to not being located in the immediate downtown core. However, good transit makes the offices of the financial district and downtown only a short ride away. This is perhaps why so many of the people living here seem to be up-and-coming professionals. Entertainment within Fort York is not very developed as of yet. 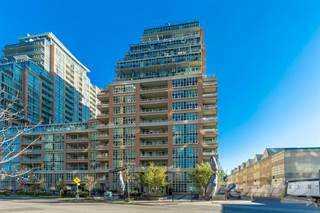 However, the close proximity to downtown, and the convenient streetcar, means that the city’s biggest attractions such as Air Canada Centre and Rogers Centre are only a short transit ride away. Fort York Toronto - LandmarkQueen’s Wharf Lighthouse Perhaps the most significant entertainment option within the neighbourhood itself is the Fort York historic site. This is a preserved collection of buildings from the era around the War of 1812. This includes several barracks buildings and the original earthworks and circular battery. The circular battery is particularly significant, as it survived the war, and is not the product of a later rebuilding effort, as most of the Fort is. There is also a statue by famed artist Douglas Coupland on Bathurst Street commemorating the War of 1812. History is on full display in this neighbourhood. The Queen’s York Ranger’s Museum is located near the western border. The Queen’s Wharf Lighthouse is another historic curiosity. Now, it sits surrounded by concrete and buzzing traffic. However, at one point it sat on a wharf at the water’s edge. It was moved once the water near its original post became unusable because of dredging efforts in the lake. Housing in Fort York is essentially completely comprised of condo buildings. These are mostly high-rises, with a few areas of row-houses also present. Despite the history within the neighbourhood, the housing here is very new. The developments in the Fort York neighbourhood were part of the ongoing efforts to reclaim the brownfield land that once lay all along the Toronto waterfront. The development started in 2005. Further development and construction is ongoing. Pricing in the neighbourhood is varied, as many different developers have worked in the area and built at various price points. Fort York ranges from the very quiet, to the very noisy. Along the interior streets where the construction is completed, the lack of pedestrian traffic during the day makes it an extremely quiet place to be. However, along the exterior streets, especially Bathurst, there is a great deal of traffic noise. Being quite new, the neighbourhood is free of run-down buildings or the urban decay seen in some parts of Toronto. At the same time though, there are active construction sites in parts of Fort York, which makes the immediate vicinity noisy and often dusty. The crime rate in Fort York is higher than it is in certain other parts of the city. It is grouped in with the numerous other waterfront communities that have a higher than average rate of both violent crime and theft related crime. Primarily, this is due to the very high population density in these parts of Toronto. Fort York is so new that the city hasn’t opened any schools within the neighbourhood. As a small neighbourhood made up of multi-unit dwellings, there is not a great deal of room available for schools either. Children living in the area must travel to nearby neighbourhoods for education at present. The Waterfront School on Queen’s Quay is the closet school for K-8 children in Fort York. Fort York has relatively good access to public transportation. The 509 Harbourfront streetcar funnels people quickly to the subway line, which provides access to the rest of the city. The 511 Bathurst streetcar line runs up Bathurst to Bloor, and allows access to Bloor and the East-West subway line. Fort York has not had time to develop much of a family atmosphere at this point. The condos are mostly smaller, and don’t make for the best settings for raising a large family. There are also no schools within the neighbourhood itself as yet, which limits the options of families wanting to live in the area.